Gearbox are busy selling the world on the idea of another cooperative shooter, named Battleborn. And the fact that the cooperative shooter that made their name has been, for many, offline since the Gamespy shutdown is not the sort of precedent they want following them around. So they’re fixing it: the developers have removed the ancient SecuRom DRM that Borderlands 1 was still shackled to, and pledged to get every version of the game up and running through Steamworks in the near future. 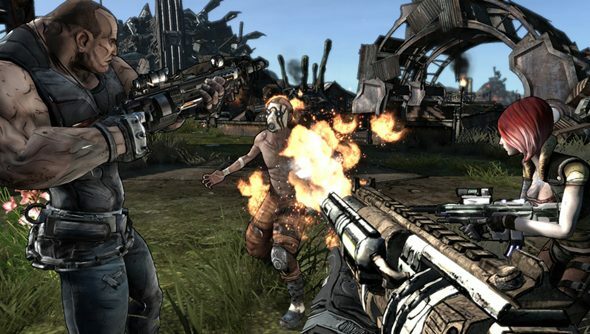 The version of Borderlands available to purchase on Steam uses Steamworks, and continues to handle multiplayer just fine. But players who bought older, retail versions of the game have been lumbered with GameSpy, and more recently a gaping hole where multiplayer support used to be. That’s changing. Yesterday’s update introduced a ‘granting tool’, accessible through the Tools tab in the Steam client, which allows players to convert retail codes into Steam versions of Borderlands. DLC bought outside of Steam can now also be activated within the client. What’s more, a ‘news ticker’ on the game’s main menu will now keep us up to date on its multiplayer restoration process. Steamworks multiplayer is coming to all “in a future update”, we’re assured. 2K’s plan for Steamworks supportof its back catalogue is a good one. But will it affect you? Given that Borderlands 2 exists, and that Borderlands: The Pre-Sequel is about to?